The Scale-up ecosystem in Bristol + Bath is rich and vibrant. Explore this map to discover support services and programmes. If your organisation specifically supports scale up companies and isn't included here, please complete this form. Discover and connect with startup and scale-up supporting organisations in the West of England. Click the link below and download the West of England Growth Map to print it. 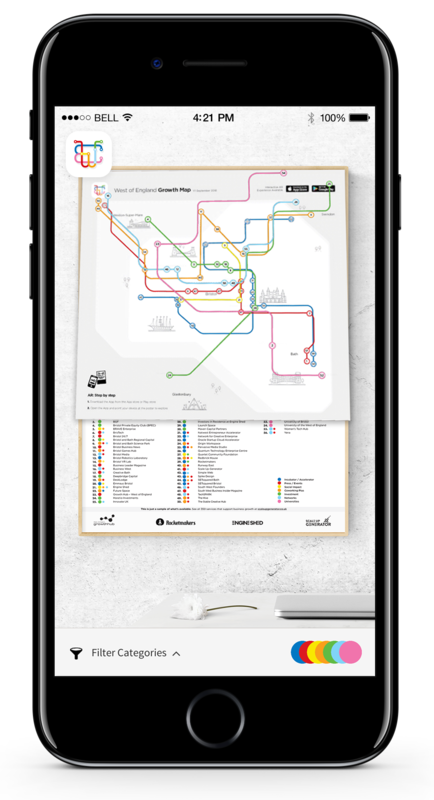 Explore the map in further, three-dimensional detail, and reach out to these organisations, through the free Augmented Reality app developed by Rocketmakers. Zeetta Networks create software that helps networks to scale fast. Following ground-breaking research and development from the team at Bristol University’s High Performance Labs, Zeetta was established with the aim to bring its academic and commercial sensibilities together. Ultrahaptics is one of the region’s biggest success stories. Founded in 2013 the company uses haptic technology to create mid-air tactile sensations without the need for controllers or wearables. Now a bustling scaleup employing over 100 people across three international offices, we sat down with CEO Steve Cliffe to talk talent. Mayden design build and support healthcare software in healthcare services in the UK and abroad. In 2015, in response to the lack of skilled talent available to facilitate scaling, they created the Mayden Academy to train developers, exactly how they wanted them. huggg is an app that aims to spread a bit of love by letting you send food and drink to friends, whenever you fancy treating them. Since being founded in 2016 they’ve gone from strength to strength – employing 14 staff and raising successful round in January 2018 led by Kindred Capital. We spoke to huggg founder Paul Wickers on their experience with accessing financing. Disrupt Sports provides custom sporting equipment for individuals, businesses and brands. From Surfboards and Yoga mats to bikes for Deliveroo. Founded in 2014 the scaleup now operates globally, has more than 20 staff with over $2m in revenue. Bristol-based data consultants Techmodal are one of the city’s best kept secrets. The team of market experts, data scientists, consultants, system analysts and software engineers have become a trusted name across the Defence, Commercial and Public sectors since they were founded in 2005. Now with a team of over 80 people, and looking to grow further, Scale-up Enabler Briony Phillips spoke to new CEO Kempton Cannons about the challenges involved in leading a scaleup.